Last week we worked in D major on a reel, using the full fretboard. Today we will change all those dimensions and work in A minor on a jig (capo 7), which is the least amount of the fretboard you will have to work with. Let’s start with a little theory (very little) and talk about scales. The scales I’ll use are in D (2 sharps in major), but can be transposed to any other key. I’m using D because it is the basis for DADGAD tuning and certainly one of the most popular keys in Irish music. So there are four “modes” that typically come into play in Irish music. I’ve notated “major” or “minor” next to each mode because this is likely how melody players will refer to them. “Note” that the “key” thing to recognize between the commonly used major and minor is that in “minor” modes, the 3rd note of the scale is one note lower than in “major” modes (natural instead of sharp or flat instead of natural). At this point recognizing a tune as major or minor is enough. Long-term, the mode comes more into play. 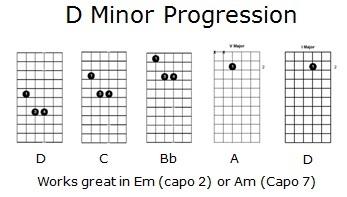 Now let’s look at a basic minor chord progression in D. Also recall the single finger approach from class as an alternative. Now, to use this for today’s tune (in A minor), we’ll need to place the capo at the 7th fret. But use the same chord shapes as you would in D (for those with shorter fingers, this will actually be much easier). Also watch to see if when you put your capo on that you don’t lose your tuning too badly. That can depend on your guitar, string gauge, and tightness of your capo. Finally, we need to change the rhythm we’re using from a reel (4/4 time) to a jig (6/8). Here is a graphic showing the difference in the strumming patterns. You’ll see that a jig rhythm is down-up-down-down-up-down… also known as pine-ap-ple, pine-ap-ple. It can take awhile to get down, try to practice it everyday without changing chords at first and then add in the changes. Today we’ll work on a well known jig, “Lilting Banshee”. It is sometimes known as Killaloe Boat or as Tes used to call it, “Killer Boat”. It is a two-part jig in Am. (Note: Thanks to BRIMS and Tes for this recording… much better than my mandolin version). Ha! I’d forgotten about calling it “Killer Boat”–but credit where credit’s due–I think that’s what Rosie Minasian dubbed it when she was what, maybe 8? Heheeee. I didn’t know that, but can definitely see it!